Smooth, straightford, uncomplicated, yet exceptionally stylish and chic, the Urban Counter Height Bar Table is just that: urban. This terrific table is a must for informing a space in a unique, understated way. The Urban Table boasts a superb design. Starting with a simple frame, and support bars mimicking the lovely, smooth aluminium square table top and providing a place for you to unwind in supreme style. Counter height tables are less dominant than a regular bar table, which is where the Urban Table makes its mark. The stunning simplicity of the piece makes it a design of supreme modern minimalism. In short, you will be proud to have this Urban Counter Table, inviting style and comfortability to your outdoor area. The industrial mood of our Urban Counter Height Table can be accentuated by placing powdered aluminium bar stools alongside it on a wooden deck or concrete pad. If you want to keep the look contemporary and robust, then factor in concrete counter height stools to really pack a punch in your space! This stunning table also looks fantastic with classic teak stools when you want to keep the look softened and easy. Perhaps you’ve got a commercial business? Several of the Urban Outdoor Counter Tables will look brilliantly uniform, sleek and chic, in your space. 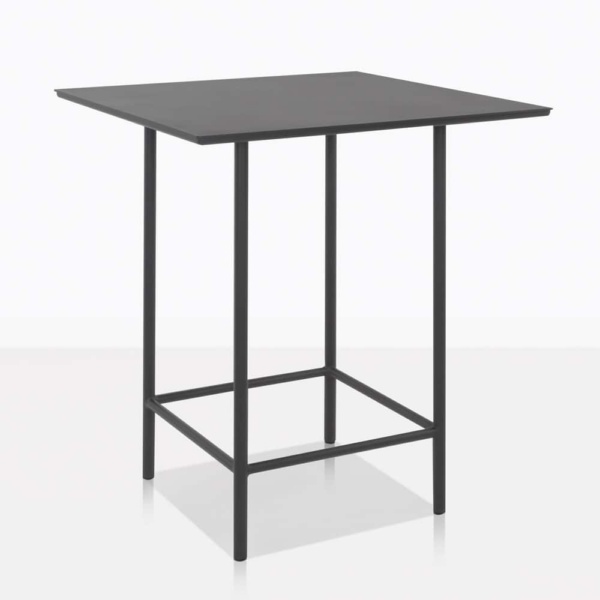 Made entirely out of powder coated aluminium, the Urban Counter Height Table is extremely robust. Keep it clean with gentle washing and your table will last the distance! Design Warehouse is known for its stylish, luxury products that are perfect for outdoor use. We have everything you need to make outdoor living a breeze! From planters to relaxing chairs, deep seating and, of course, dining… we are confident we have something that will speak to your taste and sensibilities! Make your space extraordinarily beautiful, a haven of comfort and calm. Begin with the Urban Counter Height Outdoor Table. Luxury should be yours.